L. Andrew Cooper’s fiction and non-fiction are of interest to horror and dark fantasy’s fans as well as to students and academic researchers. Scroll down to learn more about Reel Dark, Leaping at Thorns, Descending Lines, Burning the Middle Ground, Dario Argento, Monsters, and Gothic Realities, or visit Andrew’s Amazon.com author page. Welcome to a macabre cinema for the imagination, to screenings of twisted tales projected not on a movie screen but on the page. In Reel Dark you’ll find stories and poems by authors ranging from new voices to bestsellers to Bram Stoker Award finalists. Genres inside include suspense, horror, science fiction, and fantasy. You’ll meet Baby Jane as you never imagined her, a lone deputy whose pursuit of justice conjures a darker and wilder West, a director who puts FAR too much of himself into his film, a young woman haunted by a stranger who warns her of a demise linked to the cinema, and an aging actress who may have been too good at her roles. As Karen Head writes in her poem responding to Lynch, “In the movies / everything is illusion.” But in a world with cameras everywhere, how do you know whether you’re in a movie? 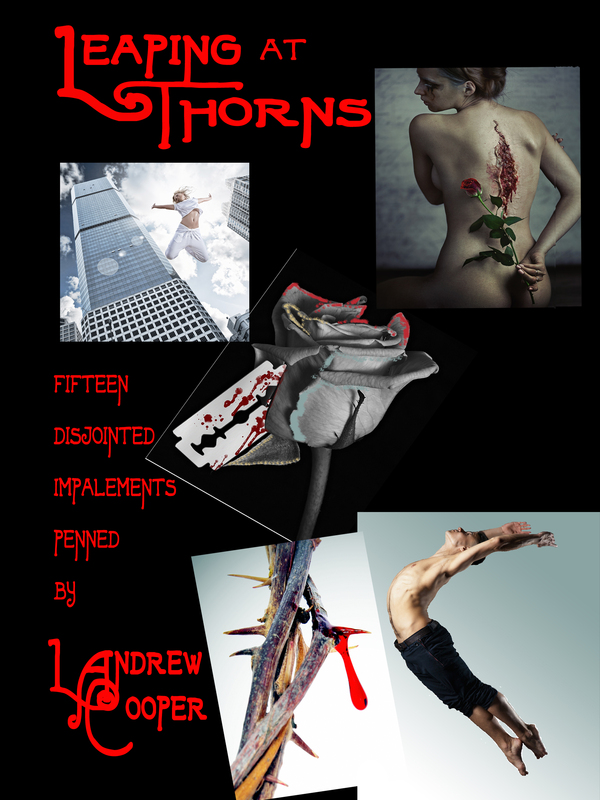 Leaping at Thorns:Fifteen Disjointed Impalements arranges 15 of L. Andrew Cooper’s experimental short horror stories into a “triptych” of themes–complicity, entrapment, and conspiracy–elements that run throughout the collection. The stories span from the emotionally-centered and violence-mild “Last Move,” about a mother and son whose cross-country move might be complicated by a haunted U-Move truck, to the almost unthinkably horrific “Charlie Mirren and His Mother,” also about a mother and son, but their lives take a turn that might be traumatic for readers as well. While “Worm Would” offers a psychosexual fantasia on the sheer grossness that is a flatworm, “Tapestry” uses absurd, sometimes comic violence to take Jessica, the young professional protagonist, into a political nightmare. The absurd reaches dark extremes in “Lachrymosa,” a story of almost pure hallucination, and stretches back toward the comic in the brain-and-tongue-twister “Heart on a Stick.” The ‘conspiracy’ panel of the triptych, from “The Fate of Doctor Fincher” to “The Special One,” is a series of standalone stories that each adds important details to the fictional world and grand scheme of Dr. Allen Fincher, who also lurks in the background of Cooper’s novels Burning the Middle Ground and Descending Lines. For early critical responses, see this post from Andrew’s blog. When Megan met Carter Anderson at Harvard, their college romance took a mystical turn thanks to The Alchemy of Will, a book by Dr. Allen Fincher that gave them the power to do almost anything, but with disastrous results. Years later, their six-year-old daughter, Caitlin, is dying a slow death from bone cancer. Dr. Fincher’s book offers them a cure: they can save the life of their first-born by sacrificing the life of their second. But Megan and Carter don’t have a second-born… yet. Only half-convinced, Megan, confined to their New York apartment, begins nine months of hell, and she and Carter enter a spiral that consumes more lives than they could have ever conceived. 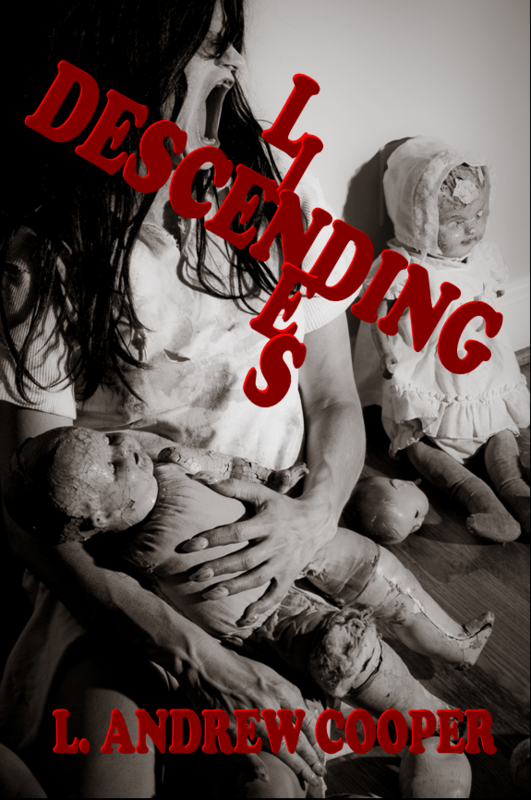 Ranging from domestic terror to all-out supernatural horror that flecks the American east coast with mangled bodies, Descending Lines takes a gut-wrenching question–how far would you go to save your child?–and turns it into a fast-paced journey to places where even nightmares fear to tread. Descending Lines: The only way out is down. Burning the Middle Ground mixes horror and dark fantasy in a tale of a small Southern town torn apart by a supernatural conspiracy. Five years after tragic murders divide Kenning, Georgia along religious lines, Ronald Glassner, a web journalist from New York, arrives to write a book about the tragedy’s sole survivor, Brian McCullough. Homicidal house pets, enucleated corpses, and menacing apparitions soon help Ronald understand that there’s something much bigger going on in Kenning, something connected to the town’s First Church and the imposing Reverend Michael Cox. With Brian, Brian’s girlfriend Melanie Grayson, progressive preacher Jeanne Harper, and police officer Winston Beecher, Ronald embarks on an investigation that takes them all into a nightmarish plot that will change the entire country. Dario Argento examines the major works of the Italian maestro of horror, from Bird with the Crystal Plumage (1970) to Giallo (2009). Together, his oeuvre mounts a major attack on preconceptions about film’s form and meaning, raising challenges against the norms of feminist criticism, Freudian psychoanalysis, narrative coherence, and conventional consistency. 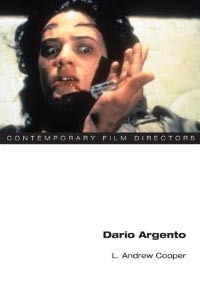 The book also includes a detailed filmography of Argento’s directorial features and two newly translated interviews. After publication, Cooper and Argento sat down to catch up on Argento’s work since the book’s release, and that interview is on the website of the University of Illinois Press. Monsters is a reader that assembles some of history’s most famous ghouls and goblins into a single volume, introducing selections from classic texts such as Dracula and Frankenstein alongside examinations of more contemporary horror films like American Werewolf in London, Candyman, Child’s Play, Psycho, and Halloween. Non-fiction selections by literary and film critics broaden the terms for discussing these texts while gesturing toward the larger cross-cultural, cross-historical phenomenon of monstrosity, which carries meanings and performs social functions that determine who we are and what we fear. While the book may interest even casual readers, it is designed primarily as a textbook for first-year college writing classes; questions and assignments after each selection direct readers to explore monstrosity through exercises that might be as fun as they are enlightening. Gothic Realities asks whether and how eighteenth-century literary critics could have been right in their condemnations of Gothic horror for corrupting the young, creating deviant sexualities,encouraging heretical beliefs, and fomenting anti-social violence. In a sense, they were right: the Gothic played formative roles in the scientific creations of homo- and hetero-sexuality in the nineteenth century, and it provided the means for articulating and even perceiving “real” ghosts. It also played an undeniable role in the tragic school shootings at Columbine High School and Virginia Tech. While the Gothic’s entanglement with these historical events is undeniable, the blame for the events lies elsewhere, a point that receives its most eloquent articulation within some of the Gothic’s most controversial works.